Today we announced that ANTaR would bring its interactive symbol of reconciliation, the Sea of Hands, to Barangaroo Reserve for National Reconciliation Week 2016 in partnership with the Barangaroo Delivery Authority. The Sea of Hands event begins with a free Opening Night Concert on Friday, 27 May (5:00pm - 8:30pm) featuring live performances by Christine Anu and Casey Donovan on Barangaroo Reserve’s Walumil Lawns, where the first part of the installation will be illuminated. Close the Gap Campaign have released their 2016 Federal Budget Position Paper. For further details read here. The Australian Red Cross Vulnerability Report released today highlights that the $3.4 billion annual prison expenditure is failing to deliver effective justice, social or economic outcomes. Aboriginal womens experiences are front & centre in the Royal Commission into Family Violence. Change the Record Co Chair Jackie Huggins commends the Report’s recommendation that significant investment in Aboriginal community controlled services should be an urgent priority for Government. ANTaR joins over twenty Indigenous and human rights organisations have signed an open letter released today calling on Western Australian Premier Colin Barnett to stop locking up vulnerable people for unpaid fines. The open letter comes in the wake of the ongoing inquest into the tragic death of Ms Dhu, a 22-year old Aboriginal woman who died in police custody after being imprisoned for unpaid fines. Read the open letter here. Over 1600 hundred community and corporate events across the country today signalled the need for a recommitment to health equality this election year. Thank to those of you who joined us for the Annual National Close the Gap Day Picnic at Redfern Community Centre. 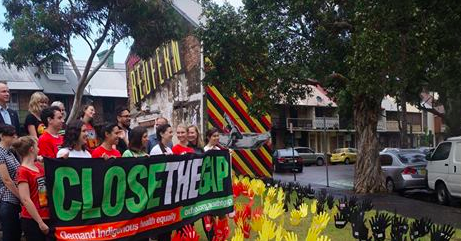 Read our National Close the Gap Press Statement here. Thanks to everyone who braved the weather this morning to join us for the Annual National Close the Gap Day Picnic. Big thanks to Close the Gap Co-Chair Jackie Huggins from National Congress of Australia's First Peoples who spoke about the unacceptable 10 year life expectancy gap that must be closed. ANTaR will again be co-hosting the Annual National Close the Gap Day Picnic with Close the Gap campaign partners National Congress of Australia's First Peoples and Oxfam Australia. This National Close the Gap Day we will be joined by City of Sydney through Redfern Community Centre. Come along and hear from Jackie Huggins, Close the Gap Campaign Co-chair, have a yarn with community members and plant a hand for Aboriginal and Torres Strait Islander Health Equality.